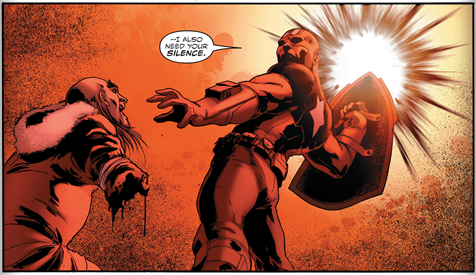 With Civil War II Issue #5 being delayed, the month between Captain America: Steve Rogers comics has felt like an age, but with Steve Rogers rebelling against the Red Skull and the promise of a Civil War II tie-in, it was bound to be worth the wait! For starters, the cover is the only thing that ties Captain America: Steve Rogers #4 into the Civil War II event, presumably because the major plot point set to precede it was delayed in the aforementioned Civil War II #5. But with the other problems I had with this issue I can only imagine that throwing the Civil War event into the mix would have only made things worse. While the plot of this series seemed to have cleared itself up over the last two issues, Issue #4 suddenly blows out to include a cast of thousands. Many of the appearances are enjoyable cameos but for the most part this issue is too tightly packed with plot threads and cutaways to really keep track of any one story. The flashbacks to young Steven Rogers and the woman in red, Elisa Sinclair, remain the strongest aspect of the Captain America: Steve Rogers series, this time providing some more insight into the first of many issues that Steve has with the way HYDRA operates, despite his faith in their ideals. Are we sure Zack Snyder wasn’t involved with this one? Regardless of any missteps this issue contained, I’m glad to have comics to read again and I’m already too invested in the tale of HYDRA Steve to stop now. See you all next issue, hopefully with some Civil War II action as promised!